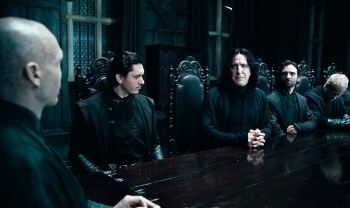 Harry Potter and the Deathly Hallows: Part 1 is on track to make up to $150 million in three days. The past two Harry Potter films have grossed around $77 million each in their respective opening weekends, and Warner Bros. expressed confidence that Harry Potter and the Deathly Hallows: Part 1 would reach up to $100 million. Early reports and advance ticket sales for midnight showings indicate that the film will top even the $100 million mark, grossing upwards of $130 million in its three-day opening weekend. Yesterday, Deadline reported that as of 6:00pm PST, "advance sales were $35 million." Deadline apparently understands the maths of how these things escalate, projecting $60 million in sales today (opening day), and between $130-$150 million for Friday, Saturday, and Sunday combined. In additional quantitative measures, Harry Potter represented 97% of yesterday's ticket sales for online ticket seller Fandango. The film was screened in 3,700 midnight showings last night, and boasts showings today on over 9,000 screens in the United States alone. Reviews thus far have been pretty positive (check out MovieBob's review), assuring that, if the final film is anything like the penultimate chapter, it'll make an even more off-the-charts sick amount of money.